" Everyone here is charged with making EVERY customer experience the best it can be! " 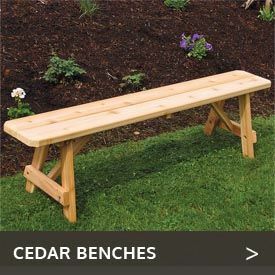 ADAMS All Natural Cedar and Cedarwood Furniture.com is an authorized factory/shop direct dealer of new first quality cedar outdoor furniture and cedar outdoor accessories for all of your home, lawn, garden, and commercial needs! American made is very important to us. Look for the flag on each product. Whenever possible we always represent American Made products over imported products. We offer customers highly competitive prices, with attentive family owned service. Everyone here is charged with making EVERY customer experience the best it can be. From pre-sale to after-sale support you'll have the full attention of dedicated furniture professionals. Give us a call. We are happy to help you! Furthermore, you're getting the quality and guarantee from our hand picked furniture companies that have been around for many years. All of the furniture manufacturers we work with are held to strict standards of excellence, and are dedicated to serving our customers. All of our products come with a warranty and a return option so you're sure to be happy and safe with any purchase you make. CUSTOMER SERVICE IS #1. This isn't just a motto. 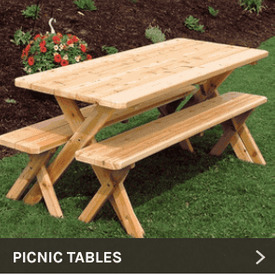 It is what differentiates us from other outdoor patio sites. We will answer the phone (if we are away from our desk we will call back). We will answer emails. We will address special requests and needs. We truly care about our customers here at ADAMS All Natural Cedar! 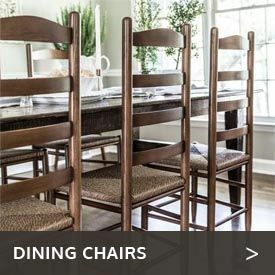 With over 20 years experience in the home decor and furniture business, we strive to provide the best quality American Made furniture at the best price possible while insuring you receive the level of customer service with us that you would expect if you were to go into a local store.